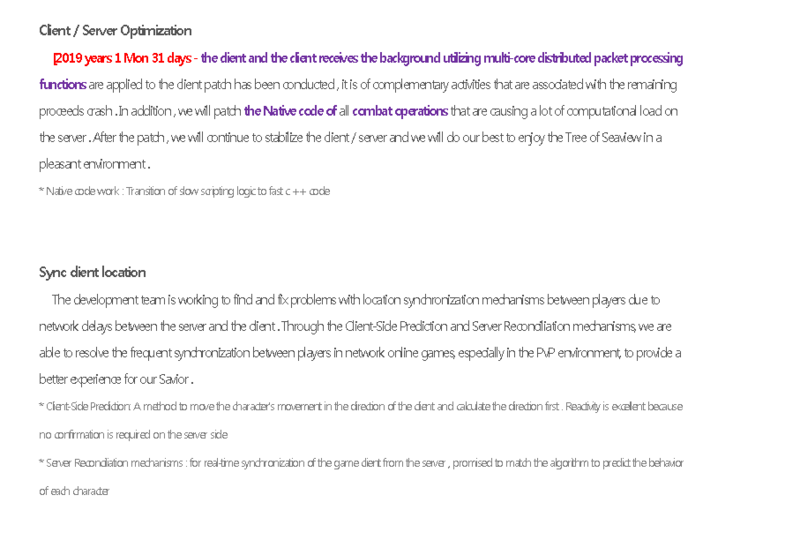 I know there’s an optimization patch coming soon:tm:, but as far as I remember it’s a FPS optimisation. Since re:build, it has been more present and overwhelming than ever, we’re at the point where we’re all used to it but sick of it. How is the game supposed to be taken seriously by new players and returning ones, when the main channels of Klaipeda crash several time on a daily basis. How is PvP supposed to be played and enjoyed, especially Feud, when not only you could cast skills and see them perform 5 seconds later, or when lag spikes happen and you find yourself in the middle of an enemy team, and to top it off, when you become unable to cast any skill after a lag spike, or the best one, when the channel crashes. How are we supposed to hunt down and farm world bosses when it’s now a common thing that the channel crashes in their second stage. Must I mention that this affects Boruta as well? There was so many crashes in Fedimian because of it that gave some of its HP back, and other servers as well I’m sure are affected. Those changes that were adressed lately concerning Boruta and Feud are nice, but the thing we need the most is a stable server now. Let’s not repeat the same problem as 2 years ago with the party quest bug, which didn’t help retain new players at all. It just feels like you never wanted your game to be highly populated. You’ve proven many times in the last years that you listen to players IMC, I used to be one of the first to follow the hate train, but you’ve been doing a good job in taking and applying feedback on many issues, and I trust this can be done as well. There’s many other issues that need to be adressed, but right now, no one enjoys going into PvP or highly populated activities without fearing a crash resulting in a waste of time and resources, and the game itself has already enough sources of frustration without this. Quite the long rant, but it had to come out. I don’t know how bad this is on other servers, but on Fedimian it is brutal. Yes, this server is low-pop compared to the rest, but that is never going to change if every time we get many players, the game just stops working. And I agree, it’s really upsetting to commit 10 minutes to Feud, trying to do well, only to crash and not get any rewards. It makes people not want to play. its not just fps fix. But at this time I can’t remember how many improvement patches they even showcased in videos that looked revolutionary, but when we got them, they barely changed anything. Gotta place hopes once again in that one. Don’t hold your breath, they didn’t bother to acknowledge it twp years ago. Date and Time(Please, specify the timezone) : Over a week, latest happened today Server Name: Fedimian Bug Description : Channels are crashing on daily basis, sometimes more than once per day. It started intensifying after last week’s patch. Mercenary post is affected too (I have a shop there and it’s often MIA). Eh, who knows… It’s in their interest after all, especially if they made so much benefit from that demon cube, they’ll want to keep more players to sell more. IMC might have improved during the last years, but we know they really like money. We have been waiting for optimization fixs to improve lag and crashes for literally 3 years so ya, I wouldnt hold your breath on any of that going away. This game is designed to hold 500 people per server, the moment you get like 30 people on within a 100 yards from each other the servers melt. Luckily 90% of the people that came back to try Re: Build have left due to this garbage and multiple other issues so the lag will eventually improve just due to less and less players as the numbers quickly return to pre re: build. Just got kicked out of gem feud again on NA server, between the 1982 servers and the amount of people trolling with full summoner builds this game is steaming horse shi* atm. Well to be fair I can’t count how many times I wished for the servers to be “dead” again just for the sake of a lagless PvP, with up to 80 people playing feud, there’s no way it’ll end good. There we go, some casual WB Blut in Fedi and channel crashes 2 times in 4 minutes (so far). Who needs channel 1 and 2 anyway? Just another normal day of feud kicking me upon entry then VGA 2 times when joining back, and now it’s past joining time. Seriously just go neck yourselves, that’s all I think of when this happens. Silute is a broken mess, frozen minimap, buff icons not showing and too much lag. Client won’t even close when you quit, had to do it through task manager. Can confirm. I’m gone. Just need to quit Forum of Savior now, which is hard as I like to see this burn and it doesn’t take as much time as the game. Ya I still go to the MS2 forums once or twice a week to tell them to fix that fkng game so I understand that feeling.